Lately, it feels like the world of storytelling has opened up. It is a moment we have waited on for far too long, and we still have a long way to go. But it seems to be happening. Could a black director get a huge budget to film an afrofuturist blockbuster? Yes, and Black Panther became an instant classic and one of the top-grossing movies of all time. 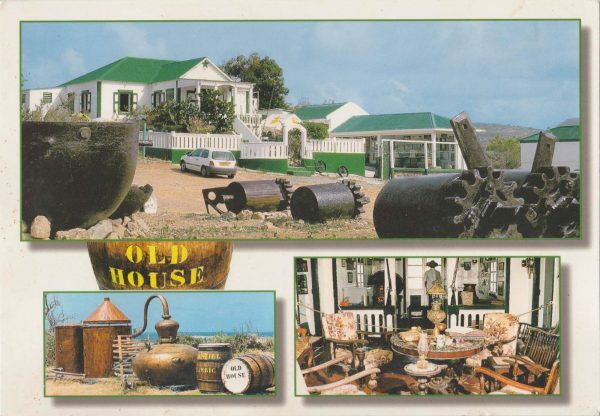 A postcard for The Old House museum. More than ever, women and minorities are getting the chance to tell their stories to a wide audience in movies and television. We’re also listening to victims as they tell their stories about wealthy and powerful abusers. The world is changing and the universe of stories is expanding. On St. Martin, storytelling has long been dominated by a minority of people and a handful of stories. We hear about a Dutchman and a Frenchman who walked around the island to divide it. It is a made-up tale, but still focuses on European men, like most of the written history of the island. We learn about Christopher Columbus “discovering” the island. We learn of battles between European armies and the Treaty of Concordia between the French and Dutch. We may become familiar with names of a few white governors and a handful of wealthy families. We learn about a small number of crops that were exported to Europe. Now is the perfect time to reconsider the stories we tell about St. Martin. The impact of colonialism and the exports that drove the local economy will always be part of the story. But there are many other stories to share, and many other perspectives that haven’t received attention. The people of St. Martin deserve to hear these stories. Sharing these stories with visitors will help them develop a deeper bond with the island. The story of bush medicine deserves a place alongside the story of sugarcane. The story of the Diamond Estate 26 is at least as important as any battle between European countries. Slave walls are as important as any fort. Luckily, we have many of the resources we need to find and tell these stories. Pierre Beauperthuy preserved many historic things in The Old House museum. Every day, Facebook is filled with photos, videos and memories about St. Martin. Thanks to the people who have held on to this history, today we have the chance to tell new stories about St. Martin. Now we can tell a deeper and fuller story about the island and its people. What untold stories deserve a wider audience? What new perspectives do we need to share to have a deeper understanding of St. Martin? Send your stories and ideas to The Daily Herald or info@lesfruitsdemer.com. Telling the stories of the salt pickers, Emilio Wilson, the slave walls, One Tete Lokhay, the Arawaks, Silk Cotton Tree (local beliefs), Flamboyant Tree (emancipation), et cetera has resulted in positive comments for our History Tour. Visitors and locals alike love hearing the ‘complete’ story, not just the white side. Great Les Fruits de Mer is uncovering more stories!